The reality is that skydiving is a big expense and the prices vary by drop zone. What’s the price for an experience you’ll never forget? In that context, the cost of skydiving is pretty cheap. When researching which drop zone to make your jump, keep in mind that even drop zones that are close may vary in price by quite a lot. As a general rule, for tandem skydives, smaller or “Cessna drop zones” tend to be cheaper than larger “Turbine” drop zones. So what’s the difference in a small Cessna drop zone and a large Turbine Drop zone? In some cases not much but in other cases quite a lot. Most drop zones charge about $200 for the tandem skydive and about $99 for the DVD. Some drop zones offer lower prices for weekday jumps. 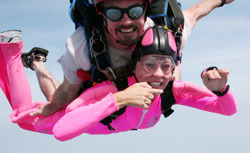 If you have a group of 4 or more, many drop zones offer a discount for everyone. Small drop zones tend to be a little cheaper since their full costs are usually lower due to use a single engine Cessna aircraft. For this lower cost, the aircraft climbs to 10,000 feet. Which will give the jumper about 15 seconds less free fall than jumps from turbine aircraft that typically climb to 13,000 feet. This reduced altitude is due to the limits of the aircraft. Larger drop zones often flew a two engine turbine. These aircraft hold more jumpers and climb to altitude more quickly, in some cases as little as 12 minutes. These drop zones usually have a greater volume of first time and fun jumpers one any given weekend. In some cases, people may get less personalized attention and spend less time with the drop zone staff. Note: skydiving planes are typically packed with skydivers. So, a potentially more comfortable ride in a turbine aircraft is relative. You will still be sitting in very tight quarters.